When the seafood minds of multiple cultures combine, it's a sensational gift to the palates that grace them. Out of Orange, California, Emporio Sushi & Mariscos serve a plethora of unique seafood based off not just Mexican cuisine, but Japanese, as well. The base of each dish is inspired by Sinaloan techniques, but incorporates Japanese flavors that we have become accustomed to from sushi restaurants. 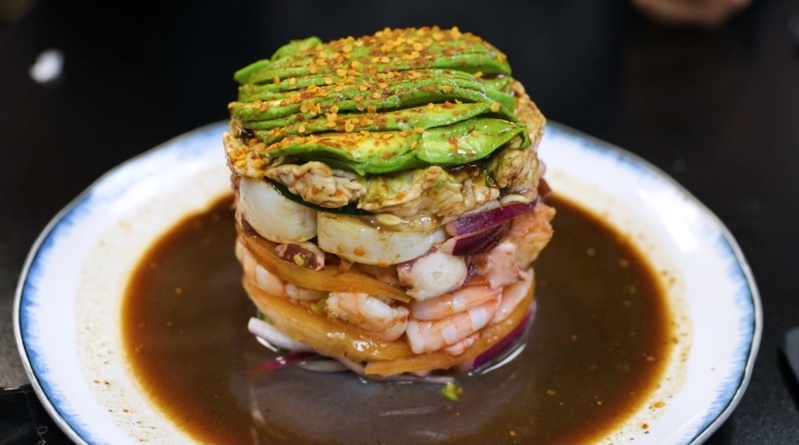 Sure you can stick to the usual avocado roll or salmon roll, but why would you when you can explore the depths of a highly stacked "Torre," which is piled high with a mix of both cooked and raw shrimp, octopus, Mexican scallops, avocado, cabbage, and a house made salsa negra. The other featured superstar is a hollowed out coconut that's stuffed with marinated shrimp, octopus, a coconut salad, and their salsa negra blend. The coconut itself is also dipped in chamoy and Tajin, giving it a bit of a Michelada feel. If you're feeling adventurous and want to try out a bold concept, this place looks like a perfect date night for your seafood-loving S.O.